President Bob Asheim called the meeting to order at the Canyon Lake Senior Citizens Center on 8 April 2015, at 6:00 PM. Approximately 55 members were in attendance. A check-in sheet was kept circulating throughout the meeting. Bob then asked to go AROUND THE ROOM for each member to report on the status of their bees. By and large, most members report their bees have made it through the winter, and are beginning the build-up phase, though 3 or 4 members report having lost colonies. Kia Smith reminded members to continue getting their annual dues to her ($10 per family for the calendar year). The Minutes of the last meeting were not read. —RAPID CITY ORDINANCE: Jerry Owens reported that the City has put the Ordinance to permit Hobby Beekeeping in Residential Areas on its active agenda. Tomorrow morning (Thursday, April 9) at 7AM, the Ordinance will be discussed at the Planning Commission Meeting, in the Council Chamber at the City/County Building. Tom Allen and Jerry Owens and others on the committee are planning to attend. If the Planning Commission has no problems with the ordinance, it will be put on the agenda for the first reading by the City Council at their Meeting on April 20, and if that goes well, the second and final reading will be at the City Council Meeting on May 4. —ORDERING BEES: John McDowell is going to pick up his orders of bees this Saturday, April 11. John can be contacted at 605-716-2600. Jerry Owens states he is still able to order more bees if people need them—packages are scheduled to be here on April 25th, and Nucs are scheduled to arrive on May 2. Jerry can be contacted at 605-381-9986, or by email at ADR Bees. —Bob Asheim reports he saw the first dandelions on March 20th in Belle Fourche, which puts this growing season at least 4 weeks ahead of normal. —Susan Nolan informed us that Bob Tolman is at the Mayo Clinic for some health issues. A card was passed around for members to sign and let Bob know we are thinking of him. Susan will get the card to him. —Librarian Dan Mulally stated there are 18 books on the book list for our Club library, and right now 5 are missing. He has purchased a notebook to use to check-out books, and is asking members to be sure to sign their name, date they borrow a book, and phone number/contact information, so we can keep better track of them. Our club books are in a box and are available every meeting. 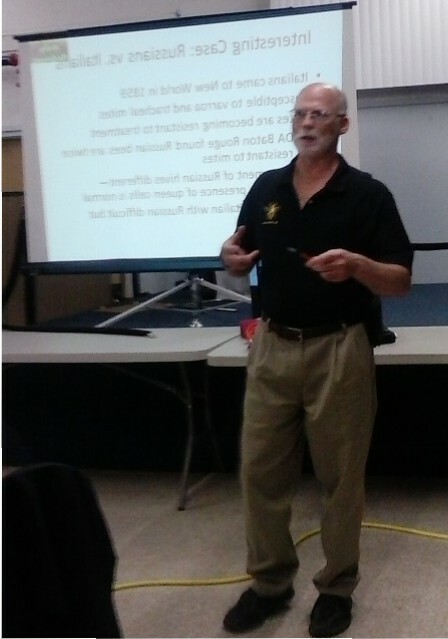 –Darrel Kjerstad brought information to the Club about “Pollinator Seeds” he sells. They are a variety of native flowers and grasses that start early in the Spring extending to late Fall, and are sources of food through the whole growing season for all pollinating insects. He lives out Nemo Road, and has planted seven acres with these seeds. He has plans to include honeybee colonies with this habitat. He can be contacted at (605) 391-4303. Dan Mulally presented two subjects for tonight’s program. The first was on the Flow Honey System, and the second presentation was on the Pros & Cons of the major bee breeds. PROS: With this honey system, beekeepers don’t have to suit up or use smoke to calm the bees, because it doesn’t require opening the hive at all, but just turning a crank. The crank moves the plastic honeycomb a fraction of an inch into an offset position, which opens the cells the bees have filled with honey, and allows the honey to flow down into a tube, which comes out of the hive like a spigot. It can flow right onto your bread, or into any jar or container you choose. You don’t have to lift heavy supers, uncap the honey, heat it, and have a centrifuge to spin it out. This system also allows honey from different blooms to be harvested separately. Keep in mind that beekeepers still have to deal with the brood boxes of the hive the same way as all other conventional methods—opening the hive, disturbing the bees, etc. So the beekeeper still gets to do the main things that are the integral part of beekeeping, while making the honey extraction process much simpler. CONS: Even though the bees build their wax onto the plastic honeycomb panels, some beekeepers think it is unnatural to be using plastic honeycomb. The Flow Honey system is more expensive than standard frames. A complete Flow Hive includes: Base, brood box with frames, Flow super, 6 Flow frames, roof, tool and tubes costs $600 plus @ $88 for shipping, and does not include bees. The Flow Honey System may not be available in the United States until December 2015. It remains to be seen how the system tests out over time, and how reliable it is. PRESENTATION #2: PROS & CONS of COMMON BEE BREEDS. Dan showed us a chart that rates the 7 most common bee breeds (African, Buckfast, Carniolan, Caucasian, Cordovan, Italian, & Russian) according to 13 different traits, such as calmness, early build up, honey collection, wintering well, and resistance to tracheal and varroa mites. However, the chart doesn’t include information on the Minnesota Hygienics, as they are relatively new (compare to the Italians who have been introduced in the New World since 1859) ! –Our concerns are to find the best bee breed to suit the climate in our specific area. What works well in Rapid Valley may not be the best in Hill City. –A study by the USDA in Baton Rouge, found Russian bees to be twice as resistant to mites as other breeds, as they are much more aggressive with the mites. Bob Asheim has had colonies of Russian bees in Belle Fourche for several years and is having very good luck with them. —Climactic and environmental conditions are always changing and evolving, and pests change and evolve; so data becomes obsolete too. —It is best for each beekeeper to experience the characteristics of the different bee strains first hand and then form an opinion about which stock best fits his or her situation. —Tom Allen winters in Arizona, and has visited the USDA Bee Lab in Tucson. He is willing to present a program on what they are doing in Arizona with bees, including incorporating some African bee genes and how that is affecting mite resistance. THE MEETING WAS ADJOURNED at 7:15. Minutes submitted by: Jan Snedigar, Secretary. This entry was posted in Archive - 2015 Minutes and tagged hives. Bookmark the permalink.